International Woman of Mystery II: Amru Sani, by Shelly Bahl; Governing Vessels, by Milcah Bassel; Force Field Series, by Charlotte Becket; The Inclining Dial, by Alix Pentecost Farren; Sunny Garden in Blue: Stories from the Caribbean to Brooklyn,by Bundith Phunsombatlert. 28 West 27th Street, 3rd Floor. >>> I’ve been awarded a New Jersey State Council on the Arts Individual Artist Fellowship for 2019! Tremendously honored and excited for the impact it will have on my production in the months ahead. >>> Father Tongue (Genesis 1) featured in Hand Papermaking Magazine, Winter 2018, Pulp The Patriarchy issue. >>> Invitation To Play: Open, Close, Open featured in Volume 7 of Emergency Index; An Annual Document of Performance Practice, published by Ugly Duckling Presse. Join us on April 6, 6 - 9 pm followed by an afterparty! >>> WE ARE PRINTING! LAST CHANCE TO ORDER! $50 with all proceeds going to Guttenberg Arts programing, supporting artists and community. Artists: Damali Abrams, Golnar Adili, Aravind Enrique Adyanthaya, Jose Ambriz, Tomie Arai, Milcah Bassel, Elizabeth Louise Castaldo, Ana Paula Cordeiro, Aurora De Armendi, Roni Gross & Peter Schell, Barbara Henry, Wennie Huang, James Kelly, KS Lack, Norah Maki, Colin McMullan DBA Emcee CM, Master of None, Luis Pons, Paul Singletin iii, Daphne Stergides. Artists: Golnar Adili, Milcah Bassel, Sue Carrie Drummond, Ingrid Schindall, Cynthia Nourse Thompson. >>> Proud to announce that I am a recipient of the Artist-In-Residence Workspace Grant for New York Emerging Artists at The Center for Book Arts. The yearlong residency begins in January 2018. >>> Wear my art !!! and support Guttenberg Arts Residencies and other opportunities for artists by purchasing an Inner-Spatial-T (shirt) during their ongoing pledge drive. >>> Invitation to view excerpts from recent performances at the Bronx Museum. This interactive performance is part of the exhibition Bronx Calling: Fourth AIM Biennial, on view through October 22. Curated by Christine Licata, Aylet Ojeda, Heather Reyes. Bronx Museum | AIM Biennial Performance Event this Friday, August 4, 6 - 10 pm. Join me for a meditative game starting at 6:30pm! All events are free and open to the public. Please visit the Bronx Museum website for admission hours and event details. 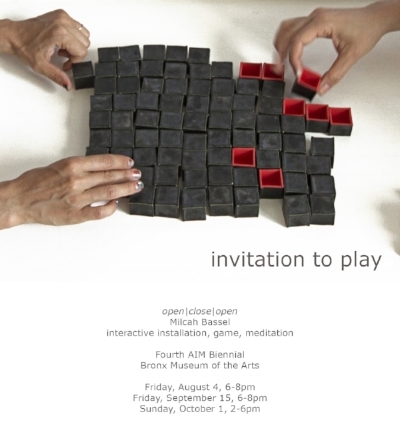 I will be present on the night of Aug 4 and on other designated dates to interact with visitors via my installation and game titled open/close/open. Consider this an invitation to join me! Additional performance dates and times to be announced soon. Excited to announce that I've been selected to partake in the Bronx Museum A.I.M program in 2017! Artist Talk at the Newark Museum coming up on Sunday, February 12, at 2pm! On 2/12 at the Newark Museum I will lead a cross-gallery tour addressing notions of space as experiential metaphor. Beginning inside the Old Stone School House we will continue to the abstract sculpture of Louise Nevelson and the ephemeral work of Ana Mendieta before culminating at the Tibetan Buddhist Altar for a participatory action. Special thanks to Gallery Aferro and the Newark Museum for this generous invitation. I'm grateful for the opportunity to take a closer look at the collection and excited to share my ideas with the public. Please join us if you can! Meeting at 2pm at the Rotunda inside the main entrance. Center For Contemporary Printmaking is holding their annual benefit on November 19 which will include a new monoprint from my "in-site" series, created this October in collaboration with master printer Christopher Shore. Artists: Milcah Bassel, Lulu cipher, Meredith Goncalves, Stephanie Quispilaya, Jennifer Torres, Hao Feng, Mediha Sandhu. Raw Forms Forum is a series of performances by a group of individual artists that are using an outdoor public space to engage in a series of dialogue with the community and each other. Through Process, Actions and Performances they will respond to topics that range from institutional, political, historical, fictional and socially conscious. They will temporarily transform the Newark Museum’s Horizon Plaza into their Laboratory as the community/audience observes, engages and/or participates. Performers: Amanda Thackray & Milcah Bassel, Lisette Morel, Ekow Kumasi, Diana Palermo, Jeremey Toussaint-Baptiste, Ayana Evans, Michael Paul Britto. Visit during Open Doors Festival hours: October 21-23 and then by appointment. Proud to announce that A Little Book of Polar Coordinates is now in the Special Collection of the Newark Public Library. July 11th wraps up 4 months of being a mentee with the Creative Capital Professional Development Blended Learning Program. In partnership with Gallery Aferro they've provided a wide-ranging set of professional development tools and resources free of charge to 24 Jersey-based artists. I am so grateful to be among them. You can learn more about this arts and artist-supporting organization HERE. They are incredible. I recently interviewed artists Anne Percoco and Ellie Irons about their project The Next Epoch Seed Library at William Paterson University. It was published on Dime & Honey on May 4th. Click HERE to read it.